Let’s face it. Standard gospel presentations don’t work with Jehovah’s Witnesses. They have been trained to ignore them. They focus instead on teaching us “the truth”—that is, Watchtower theology. 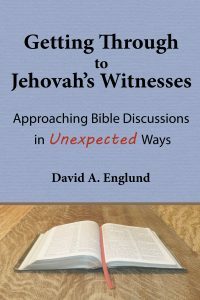 The key to effective communication with Jehovah’s Witnesses is getting them out of their prepared presentations by approaching Bible discussion in ways they won’t expect. In this way, the Christian can get them off autopilot and help them focus on what the Bible is really saying.